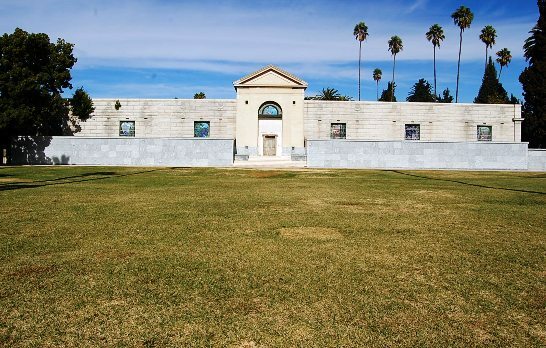 This past summer a controversial construction project began at the front of the historic Cathedral Mausoleum at Hollywood Forever Cemetery—four additions of crypts and niches were constructed, two on each side of the entrance. 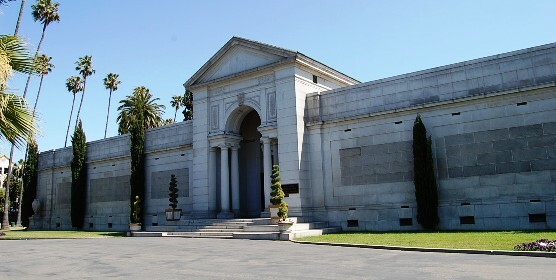 The mausoleum is the final resting place for many of Hollywood’s pioneers and film celebrities. Every August 23rd, fans of Rudolph Valentino gather there to pay their respects to the actor in the mausoleum’s massive foyer. 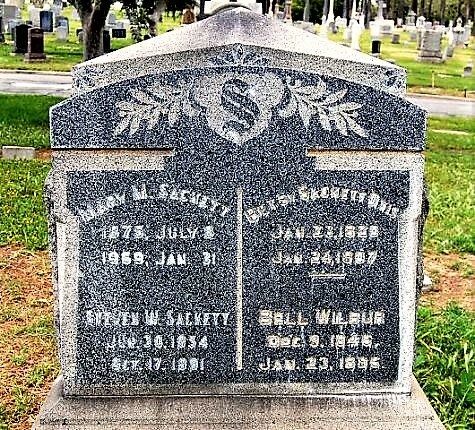 In 1937, the founder of Hollywood, Harvey Wilcox, his wife Daeida and other family members were moved here from their former resting place at Rosedale Cemetery. 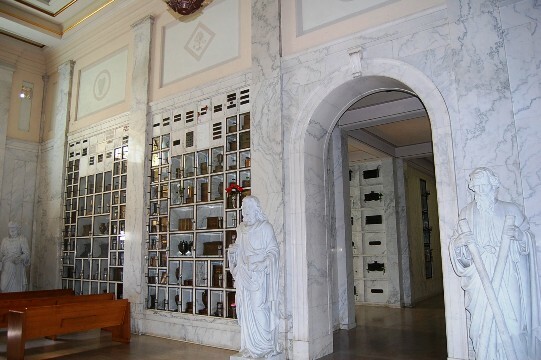 The completed mausoleum, in existence now for 89 years, has only a few original crypts remaining for sale. 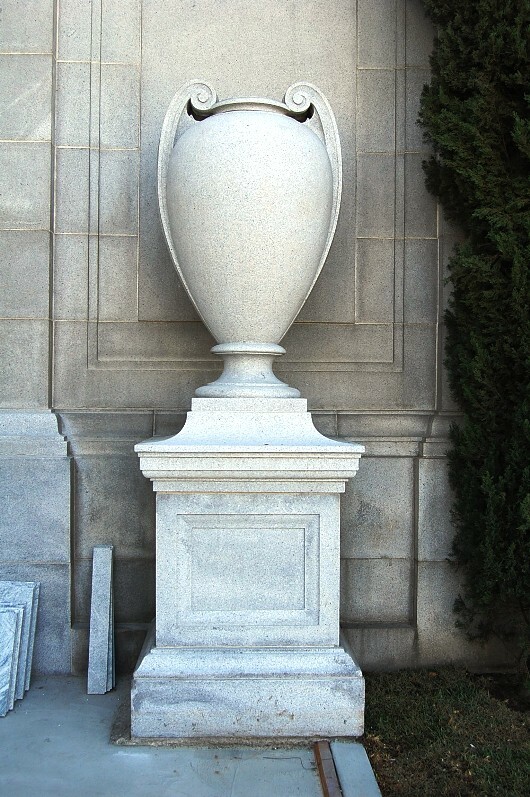 This is a brief story of the mausoleum’s history. Mausolus, Satrap and ruler of Caria from 377 to 353 B.C., and husband of Artemisia, achieved distinction as the first ruler ever to be honored by the erection of a monument in which his own remains were placed. Though Augustus and Hadrian in Rome may have exceeded in splendor the structure which the widow, Artemisia, built in her husband’s honor, they could not leave to posterity, as Mausolus did, a name for an institution that has continued to surround the burial of loved ones with beauty, refinement and sacredness. It is from Mausolus that we derive the word mausoleum. In 1919, Hollywood Cemetery completed the first unit of a modern replica of such an ancient structure. 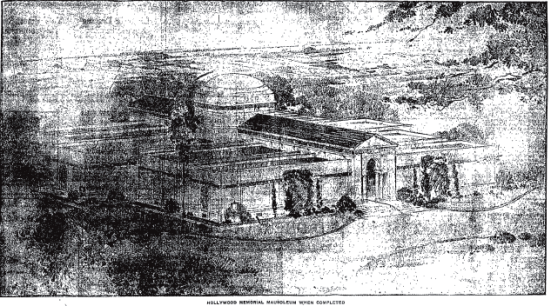 The plans to build a large mausoleum on the grounds of Hollywood Cemetery were first envisioned in late 1916. The original illustrations for the imposing building were somewhat different than what was finally constructed. 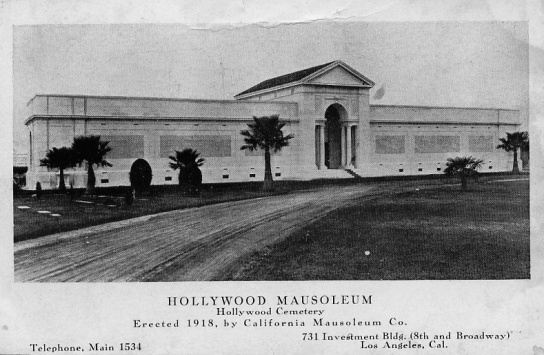 Above is the original design for what would be the Cathedral Mausoleum at Hollywood Cemetery, January 1916. 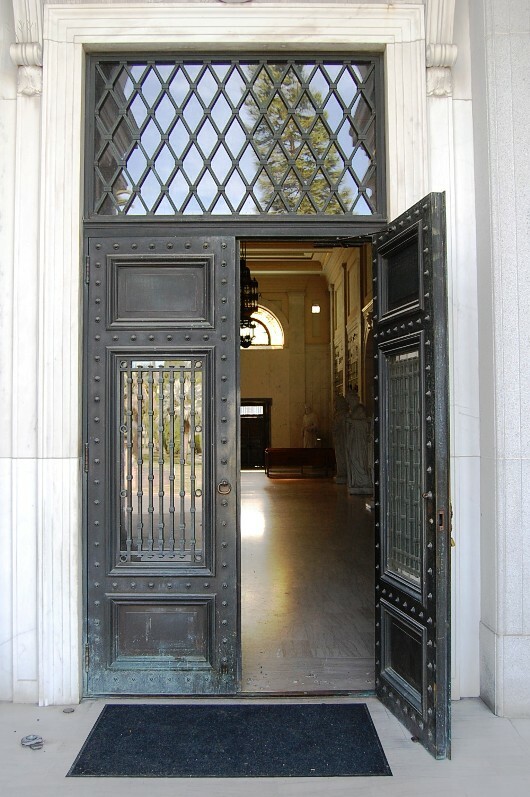 In October, 1917, the California Mausoleum Company, who had constructed mausoleums at Evergreen Cemetery in Riverside and one at Inglewood Cemetery, was hired to oversee the project. 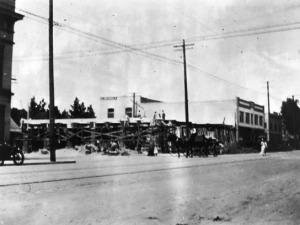 The architectural firm of Marston and Van Pelt of Pasadena drew up the plans and William C. Crowell was hired as contractor. Construction began immediately. 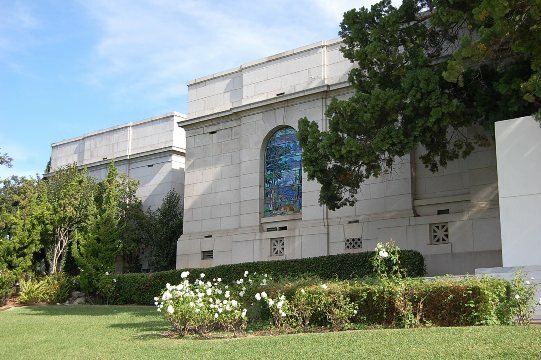 The plans called for a structure much larger than the Inglewood mausoleum with the edifice of concrete, brick and steel construction, faced with heavy blocks of California granite, and set with rusticated joints. The interior is finished throughout in marble, with decorative features in bronze. Art and cathedral glass was used for ceiling and window lighting. The mausoleum follows the Italian Renaissance design, with the central entrance having a Palladian motive executed in marble. Above is the completed first unit of the new Hollywood Mausoleum. For those that are familiar with the mausoleum, does anyone notice something strange? I will address it at the end of the article. Above is a corridor in the first unit built for the Cathedral Mausoleum. It took a year to finish construction and the unit was dedicated in October 1918. 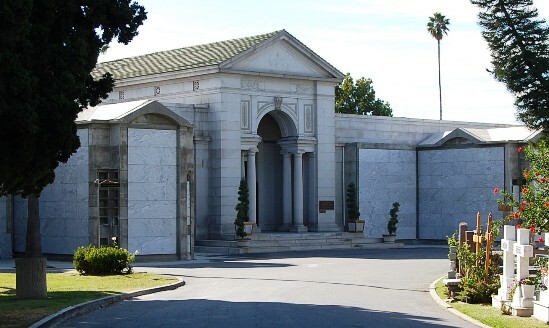 The demand for crypts in the new Hollywood Mausoleum, as it was called at the time, was great and quickly sold out. In April 1921, the cemetery announced the construction of the second unit of the mausoleum. New plans revealed that the mausoleum would comprise, when completed, five units covering more than three acres, and provide for 6,000 crypts, all above ground. Both individual crypt groups and family sections would be arranged over a huge rotunda, around a great central alcove and along the sides of radiating corridors. At a total cost of $2 million dollars, it would be the largest structure of its type in the world. Above is an artists rendering of what the completed Hollywood Mausoleum would look like. It’s not a great copy but the large rotunda and two other units behind it can still be seen. Above is the rear of the Cathedral Mausoleum. The empty lawn is where the rotunda and the additional units would have been located if plans were followed. The second unit was finally completed in September 1922. The new structure contained an additional 888 crypts, giving the entire mausoleum a total capacity of 1,454 crypts. In the new section there were 744 individual crypts and twenty-four family sections of from six to twenty-four crypts each. All were faced with Alabama marble. 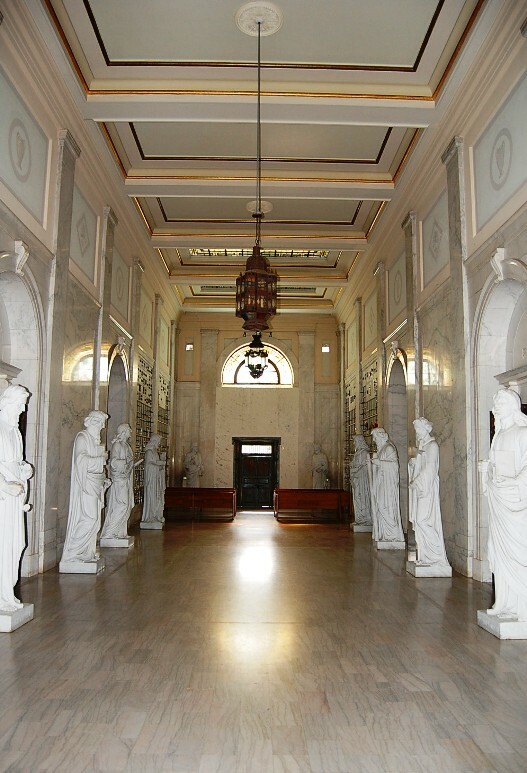 The family sections are separated from the main corridors by bronze gates or marble pedestals (the gates are missing is some sections and the marble pedestals are no longer there). There is also a section for those who desired cremation using specially designed urns provided by the company. Above is a corridor in the Cathedral Mausoleum with the original gate of a family room still intact. The main corridor, which originally was designed as a chapel, had a religious note by the design of the interior and by the use of artistic stained glass, which softened the light and gave the entire room an air of reverence. 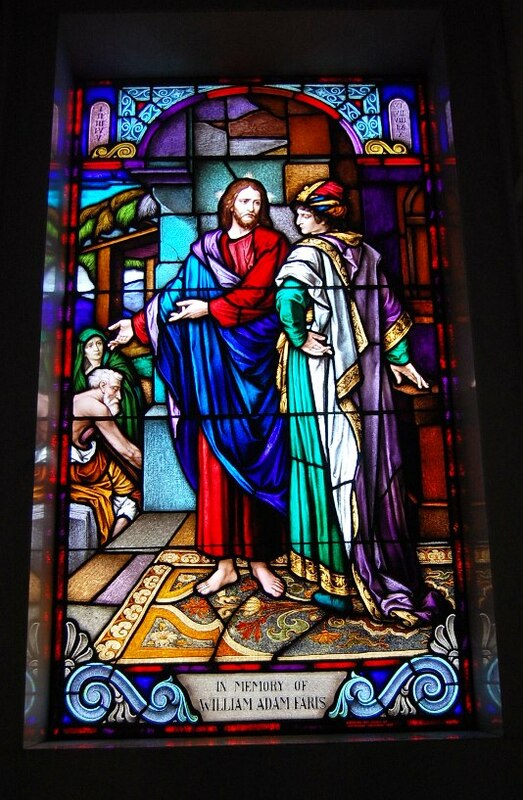 A large floor-to-ceiling stained glass window once located on the southern wall, no longer exists except for the top archway glass. The remaining stained glass has been removed. At the time, plans were made for a series of mural designs as decorations for the room. The corridors were carpeted and lined with potted plants and shrubs. The main foyer in the Cathedral Mausoleum can be seen above. The stained glass window near the ceiling at one time went down to the floor. It is now boarded up and a door leads out to the rear lawn. 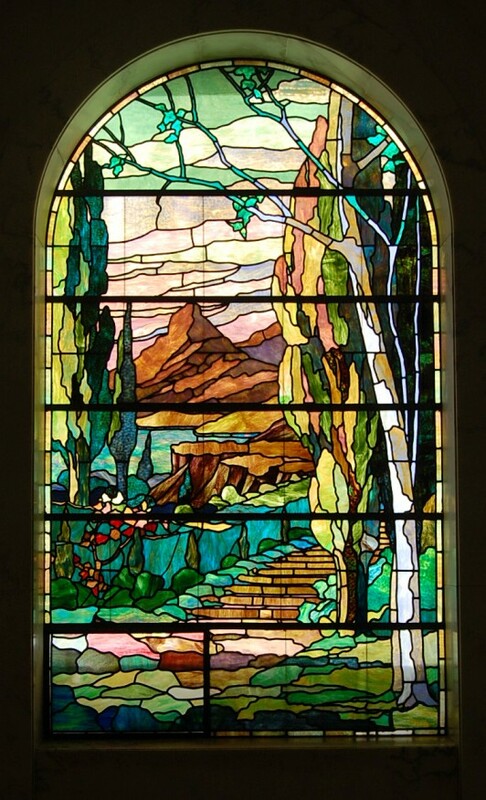 The stained glass window in the private family room of millionaire merchant, William Adam Faris. The builders promoted a new ventilation system used in the mausoleum that was advertised as “incomparably sanitary” which can be seen above. “Inspect for the first time the building which eventually will contain 6,000 above-ground crypts—built of concrete, and faced with granite and marble. The plans for the remaining three units and the great central alcove were never completed. 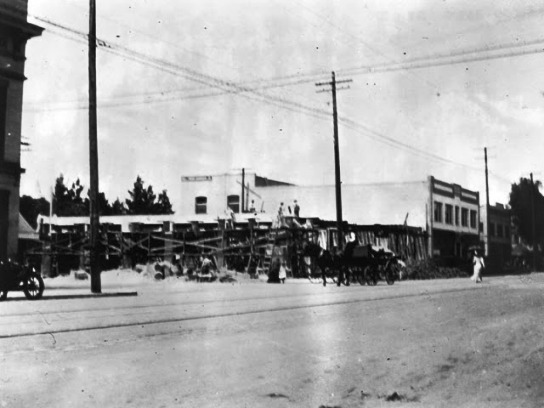 Hollywood residents, led by Senator Cornelius Cole, resisted the expansion of the cemetery during construction of the second unit and threatened litigation, even petitioning to have the cemetery closed. At the same time construction of crypts and a chapel were taking place on the western end of the property. Even when the problems were ironed out, the plans to expand the mausoleum never materialized. It’s unfortunate that the vision was not realized; it would have been an imposing and architecturally beautiful structure. The first internments in the second unit of the Cathedral Mausoleum were Samantha Kelly and her grandson, Harry Earl. Kelly, a pioneer hotel woman, was born in Ohio in 1828. She came to Los Angeles from Indianapolis in 1882 in one of the first trains that travelled westward over the plains. 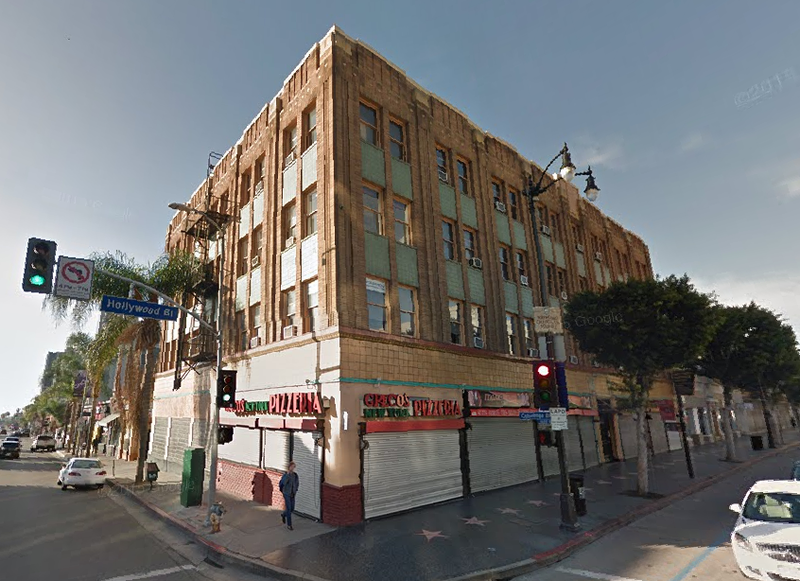 She was one of the pioneers in the hotel business in Los Angeles and at different times owned and managed many of the largest hostelries in the city, including the Figueroa and the old Heatham and Ardmore hotels. Kelly’s grandson, Harry Earl, was at one time the stage director of the old Belasco Theater and had died nine years earlier. He was almost worshipped by his grandmother, as well as by his mother, Katherine Earl. 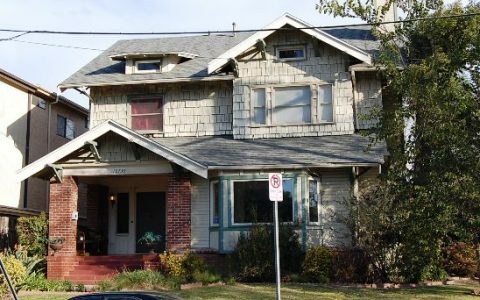 When he died in 1913, the two women kept his ashes with them at their home, 417 South Central Avenue. 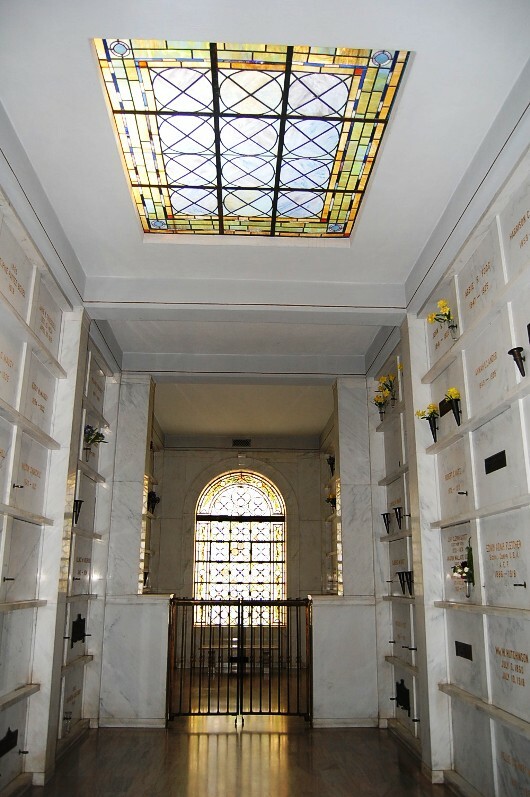 When Samantha Kelly died on July 22, 1922 at the age of 94, she was interred in a crypt in the still uncompleted mausoleum and in the crypt next to hers was placed the ashes of her grandson, Harry Earl. The crypts of Samantha Kelley (left) and her grandson, Harry Earl. 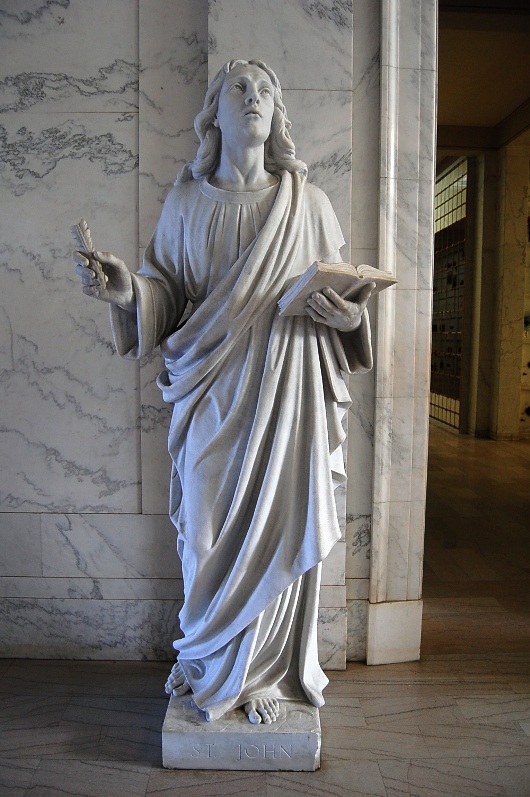 The statues of the twelve apostles which now line both sides of the inside corridor, were originally to be placed on pedestals in a semi-circular lot behind the mausoleum. But these plans also never came to pass and it was decided to move them indoors, where they will probably remain permanently. Several years ago electricity and lighting was added to the interior making it available for nighttime services. 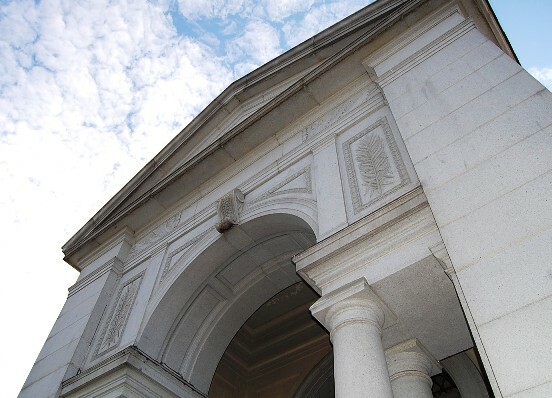 The damage to the mausoleum caused by the neglect of the then-owner, Jules Roth in the 1990s was restored when Tyler Cassity bought the cemetery. 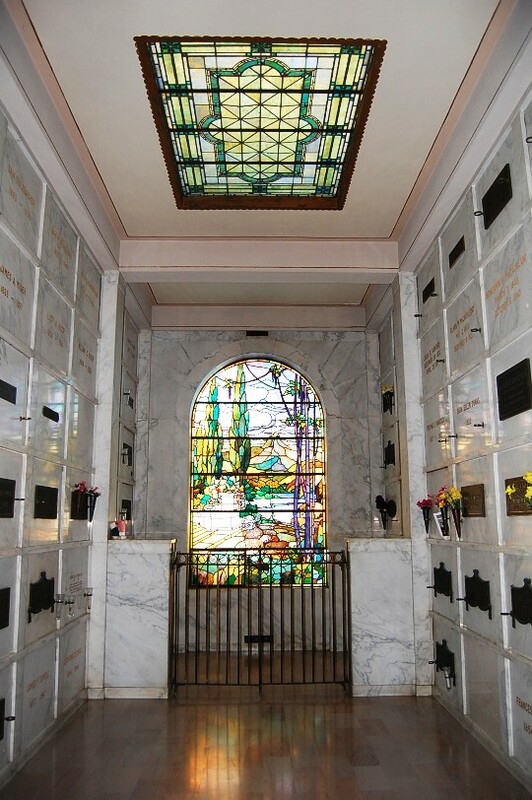 Whether the current changes made to the Cathedral Mausoleum will cause further concern to those who love Hollywood Forever Cemetery, are still to be heard from. Once the facings and architectural trimmings are completed, I will post photographs of the finished product. The stained glass window that is next to Rudolph Valentino’s crypt. The oddity in the photograph I mentioned earlier is what looks like grave markers in the ground in front of the mausoleum. There have never been graves there. If they are grave markers, they were obviously moved but the questions are who were they and where were they moved to. Gideon Curtis Moody was a forceful, brilliant speaker, a man who detested shams and subterfuges, whose professional and private reputation was stainless. He commanded the profound admiration of his neighbors and friends, and his vigorous, pleasing personality made him a figure of prominence in the Northwest. He was South Dakota’s first Senator and that states Moody County is named in his honor. Moody was born in Courtland, New York on October 16, 1832 where he spent his early years. He studied law at Syracuse and was admitted to the bar when he was only 21. He practiced law there and moved to New Albany, Indiana in 1852 and was appointed prosecuting attorney for Floyd County in 1854. Moody married Helen Eliot of Syracuse on September 21, 1855. In 1860 he was elected to the Indiana State Legislature and served until the outbreak of the Civil War. In April 1861 he enlisted in Co. G, Ninth Indiana Infantry and was commissioned a Captain. He was with that unit until the fall of 1862 when he was promoted to Colonel and assigned to the command of the Nineteenth United States Infantry, which was stationed at Indianapolis and Fort Wayne. Moody was given a command at Murfreesboro, Tennessee and was named chief mustering officer with Major-General George H. Thomas. After the Civil War he moved to Yankton, Dakota Territory and took an active part in the development of the Northwest. He was appointed associate justice of the Supreme Court by President Rutherford B. Hayes, and his district at that time comprised all the territory west of the Missouri River. He filled this position from 1878 to 1889. On November 2,1889, as a Republican, he was elected the first United States Senator to the new state of South Dakota along with Senator Richard F. Pettigrew. He remained a senator until 1891. He was also a member of the Territorial Legislature for two years, and was Speaker of the House. He was a member of the State Constitutional Convention and was the first provisional Senator. Moody’s specialty as judge was in corporation law and riparian rights and he ruled on many important cases. For many years he was the confidential attorney of the Homestake Gold Mining Company at Deadwood, South Dakota, which was the richest gold mining corporation in the world, and of interest to then Senator George Hearst, the father of William Randolph Hearst. Until his death, Moody was the confidential attorney of Hearst’s mother, Phoebe. Around 1899, Moody began making occasional visits to Los Angeles and found the climate beneficial to his health. After his daughter and her husband settled here he spent the last nine months of his life with her while building an elegant mansion next door at 1019 Beacon Street. He and his wife moved into their new home only two months before his death. On March 17, 1904, Moody died at his new residence from Bright’s Disease; he was 71. 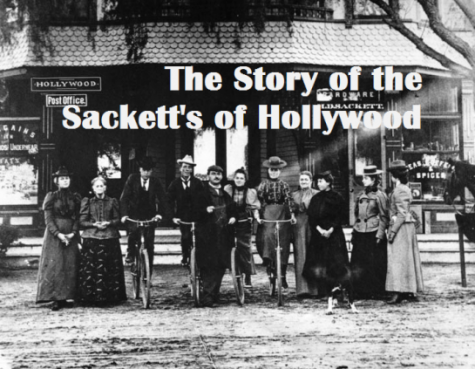 He was survived by his wife Helen and five children: Helen Dickenson of Los Angeles; Charles, editor of the Sturges Record (South Dakota); James, an attorney at Deadwood; Burdette, a civil engineer with the Homestake Company, and Warner, recently graduated from Yale and in a law office in Deadwood. Moody’s grave is located at Hollywood Forever Cemetery in the Chandler Garden’s (Section 12) just east of the Harrison Otis obelisk and a short distance from the road. For the past 105 years, all published biographies have stated that Moody was buried at Rosedale Cemetery. This error is included in the official Biographical Directory of the United States Congress and is listed as such on Findagrave. The confusion probably came from his obituary which noted that his body was “placed temporarily in a receiving vault at Rosedale.” Hopefully that inaccuracy can now be corrected. To read more about Gideon Curtis Moody, check out this article at Deadwood Magazine. The Magic Castle, located at 7001 Franklin Avenue at the foot of the Hollywood Hills, is currently observing the centennial of it’s headquarters which was built by banker Rollin B. Lane in 1909. To celebrate, over the next couple of weeks I will post a biography of Lane and the history of the mansion and articles on magic and magicians in Hollywood. Today is a look at the dean of magicians, Harry Kellar, who upon his retirement, spent the last fourteen years of his life in Los Angeles and is also interred here. Harry Kellar, known as the “Dean of American Magicians,” enjoyed both public recognition and financial success. His was the largest and most elaborate stage illusion show touring during the late 1800s and early 1900s. He is best known for his spectacular version of the Levitation, in which a girl mysteriously rises up from a couch, floats across the stage to the audience, then disappears into thin air. Upon his retirement in 1908, Kellar chose to spend his remaining years in Los Angeles. Kellar was born Heinrich Keller on July 11, 1849 in Erie, Pennsylvania. The son of German immigrants, his father, Francis P. Keller, had been a soldier under Napoleon. At the age of ten, Harry was put to work and found employment at Carter’s pharmacy on North Park Row. One day, while experimenting with chemicals he knew to be off-limits, he blew a hole in the shop floor. Knowing his father would be harsh with him, he jumped aboard an outbound train and left Erie. Now a vagabond, Harry performed a series of odd jobs and was soon taken in by a minister in upstate New York, who offered to adopt him if he would study for the ministry. However, it was a chance visit to a traveling show that displayed the conjuring of The Fakir of Ava that enchanted the youngster. Kellar later confided to Houdini that he “immediately got the urge to go on the stage… became very restless, bought books on magic and finally left my friend and benefactor.” Harry traced down the Fakir, became his assistant, and began his professional training. After several false starts and some disappointing results, Harry became connected with the Davenport Brothers and Fay, celebrated mediums who were involved with the “Spiritualism” movement. Harry continued with the Davenports for four years as their business manager, learning the cabinet tricks and becoming more expert at them than the brothers themselves. During this period he traveled extensively throughout the United States. Harry reportedly changed the spelling of his name to Kellar because there was another popular magician named (Robert) Heller and wanted to avoid any possible confusion. It wasn’t until 1911 that he legally changed his name to Harry Kellar. Kellar was famous for his playbills and advertisements featuring imps and devils, implying, without totally stating, that his skills were really powers gained through dealings with dark forces. This enticing idea brought people to his show in droves. In 1873, Kellar formed a partnership with Fay, former partner of the Davenport Brothers, and as Fay and Kellar, toured Mexico and South America, acquiring an extended knowledge of the magician’s craft. Combining Kellar’s old magic tricks with a Davenport-inspired séance, was one of their showstoppers. After a shipwreck in 1875 on their trip to England left them destitute, Fay left the act to rejoin the Davenports. On his return to the United States, Kellar joined Ling Look and Yamadura, billing themselves as Royal Illusionists, setting out on a tour of South America, Africa, Australia, India, the Philippines, Japan and China. While performing in China in 1877, both of his partners died, and for a time he toured alone. For five years beginning in 1879, he traveled with J. H. Cunard under the name of Kellar & Cunard, giving exhibitions in Asia and Egypt. In 1882, Kellar was performing in Melbourne, Australia and met a fan, Eva Lydia Medley, who wanted his autograph. Kellar was smitten and promised to correspond with her while on the road. They exchanged letters for the next five years. Kellar specialized not so much in feats of sleight-of-hand, as in other branches of the magicians art, more particularly those involving the use of apparatus, many of which Kellar was the originator, and are still models in magic today. One of Kellar’s more popular illusions was The Levitation of Princess Karnac. One version of this was later purchased by Harry Blackstone, Sr., who used the trick for many years. Others included the Vanishing Birdcage, the Vanishing Lamp, and his automation Psycho, which was a popular attraction wherever it played. Kellar returned to the United States in 1884 and began appearing alone and played here continuously. Eventually Eva arrived in America and played the cornet in the show and began learning about magic. They were married on November 1, 1887 at a church in Kalamazoo, Michigan and she continued to play an important role in his shows. Kellar’s strength was his presentation. Over the next twenty years, he became one of the best known magicians in the world and once performed “The Nested Boxes” illusion at the White House for President Theodore Roosevelt and his children. 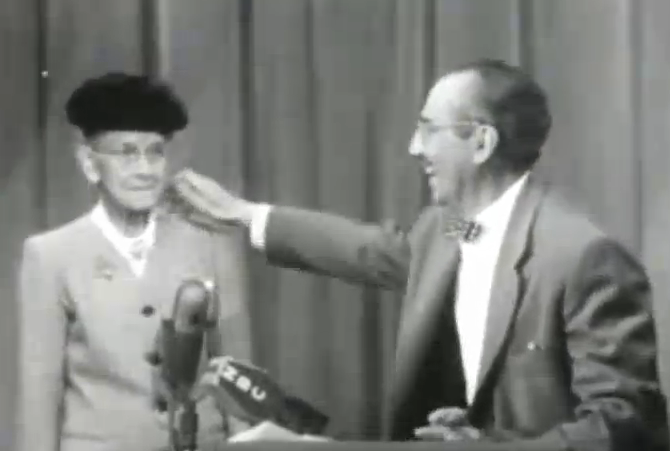 On May 16, 1908, Kellar retired and in a grand onstage ceremony at Ford’s Theatre in Baltimore, removed his cape and placed it on the shoulders of his chosen successor, Howard Thurston. Not long after, Kellar and his wife retired to Los Angeles where his sister Anna Marie lived. 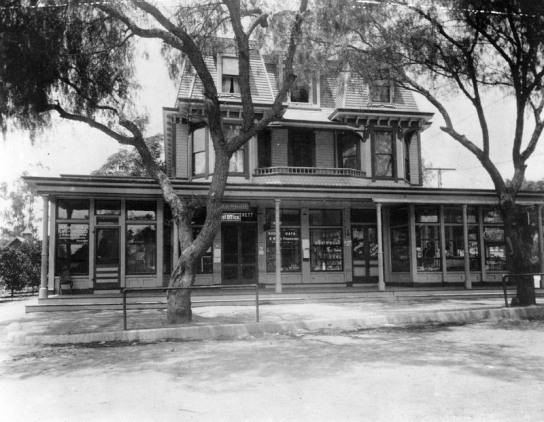 They bought a house at 698 Wilshire Place (demolished) and it was here that Eva died sometime before 1910. At the end of his career, Kellar befriended Harry Houdini, who idolized the elder magician. Houdini was a frequent guest at Kellar’s Wilshire Place home. Much of what is known about Kellar comes through Houdini, who conducted several interviews to help chronicle the history of magic. Houdini, in his fight to unmask fake mediums, once admitted that there was only one man who knew more about them than he did – Dean Harry Kellar. Few men were more stubborn than Houdini, but he was no fool. He knew that Kellar had investigated the stunt himself and assumed that there must be more than enough reason for such strong advice. Houdini quietly withdrew his plan. On September 7, 1917, a banquet in Kellar’s honor was held at the Angelus Hotel on the corner of Fourth and Spring Streets. After the meal, each magician gave exhibitions of their skill. Kellar demonstrated his famous “Kellar Rope Tie” and string tricks, and even those who assisted could not solve them. Two months later, on November 11, 1917, Houdini convinced Kellar to perform once more. The event was an enormous show held at New York’s Hippodrome to benefit the families of soldiers who perished when the USS Antilles was sunk by a German U-boat. After his performance, Kellar started to leave, but Houdini stopped him, saying that “America’s greatest magician should be carried off in triumph after his final public performance.” The members of the Society of American Magicians helped Kellar into the seat of a sedan chair, and lifted it up. The 125-piece Hippodrome orchestra played “Auld Lang Syne” while Kellar was slowly carried away. 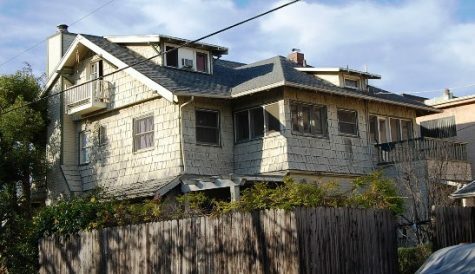 At some point, Kellar moved in with his sister Anna Marie Buck at 460 S. Ardmore Avenue (demolished) near S. Normandie and 5th Street. It was here that Harry Kellar died after a brief illness on March 10, 1922. 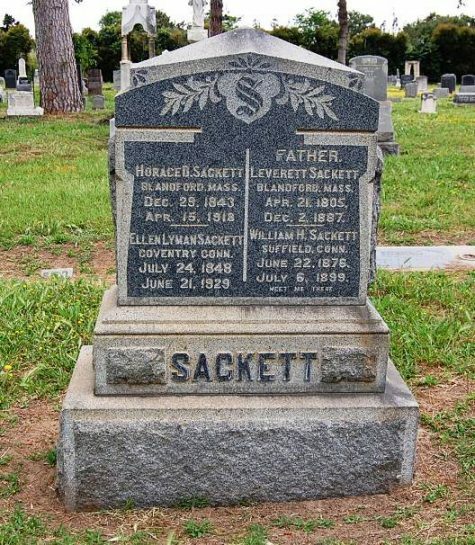 He was interred at Rosedale Cemetery but his grave was unmarked for almost 80 years until 2001 when the Academy of Magical Arts, who are headquartered at Hollywood’s Magic Castle, placed a stone there. Click below to view a 16 second film of Harry Kellar with Houdini.